Horsham boss Dominic Di Paola felt his side put in an ‘excellent’ away performance to notch their 14th win of the campaign on Saturday. Kieran Lavery notched his first goal for the club and Chris Smith was also on target in a 3-1 victory away at eighth-placed VCD Athletic. Rob O’Toole competed the scoring in the second half after the hosts had pulled a goal back in a resurgent start to the second half. Victory kept the Hornets fourth in the Bostik League South East Division and Di Paola was extremely satisfied from his players’ performance. “It’s an away game against a side that were just outside the play-offs and first half I thought we were excellent. “At the start of the second half, we have had a bit of a stutter for the first 15 minutes, but we tweaked the shape and dealt with that, we didn’t get to grips with it at first. “That early goal going in made us a bit nervy but after that we were comfortable again and Pells (Josh Pelling) really hasn’t had much to do. “The last couple of games we have really done the battle and the work, which is good to see. It was great for Smudge (Chris Smith) and Lavs (Kieran Lavary) to get a goal as they have been desperate for one. 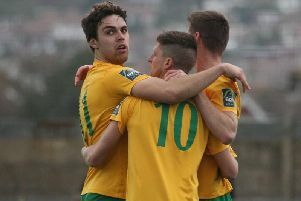 Horsham have tweaked their formation in the past two games with O’Toole playing a deeper defensive role when they defending, before joining the front two when they are attacking. Di Paola explained: “The only reason we have had to do that is with Charlie Harris being out, Dean Lovegrove suffering with a dead leg and Scott Kirkwood just coming back in, we are a little light in central midfield. That’s the logic behind it.